Sunday the 20th of March is Palm Sunday. The 6.00 p.m Mass will be the main Mass for the Day before which a couple of palms and olive branches will be blessed and then distributed. At 6.30 p.m. the Philharmonic Society Santa Maria will organize a Via Crucis in the Parish Church. It will take the form of a Eucharistic Adoration. Rev. Canon. Noel Saliba Spiritual Director will preside. Mass will begin at 5.45 p.m. at the beginning of which Confession will be administered. There will be various confessors to hear confessions. The 6.00 p.m. Mass will be especially for the children in preparation for the Holy Triduum. It will be animated by the choir. At 9.00 a.m. in the Cathedral Church, Bishop Mario Grech will preside over the Chrism Mass. At 6.00 p.m. the Liturgy will begin in the Parish Church during which the Archpriest will wash the feet of twelve men who represent the College of the Apostles. At the end of the Liturgy, the Blessed Sacrament will be transported to the Altar of Reposition while the Pange Lingua will be sung by the choir. At 8.00 a.m. the Church will be open and the Liturgy of the Hours will be said (Matins). At 9.30 p.m. the Prayer known locally as ‘Is-Seba’ Viżti’ will take place. 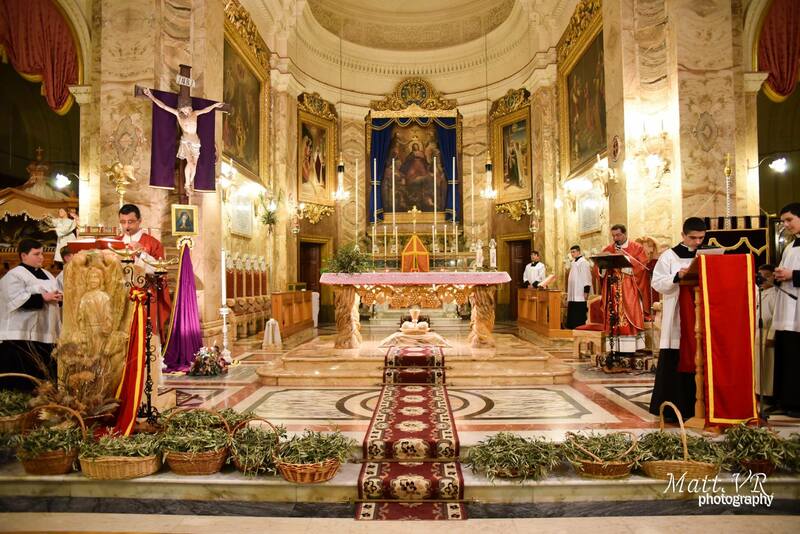 At 3.00 p.m. the Solemn Liturgy of the Adoration of the Cross will begin. At 6.00 p.m. the Procession will begin to process accompanied by the Santa Marija Band. At 8.00 p.m. the Liturgy of the Easter Vigil, the crown of all the liturgical year, will commence. The Exultet will be sung succeeded by the seven readings, the reading of the Epistle and the Gospel. The Gloria will be sung just before the proclamation of the Word. Known in the English speaking world as Easter, the precise term for the greatest solemnity of the Church is Passover from the Aramaic Pesach. The Church celebrates the Resurrection of the Lord Jesus Christ and his triumph over death, sin and Satan.